Muhammad Ali, who passed away on Friday, June 3rd, is known for many things, though music is not the first worldly pursuit you would associate with the World Champion boxer and humanitarian. But he was close friends with people all over the music world, including in country music, and especially with the four men that some consider the Mount Rushmore of country music, otherwise known as the supergroup The Highwaymen comprised of Willie Nelson, Waylon Jennings, Kris Kristofferson, and Johnny Cash. All four men were close with Ali, and were introduced to him through Kris Kristofferson, who was a boxer himself, and a friend of Ali’s for many years. 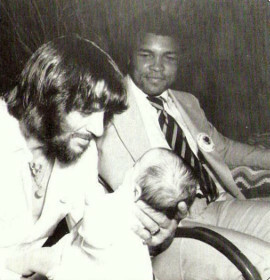 Ali and Waylon became such good friends over the years, Ali was in attendance for the christening of Waylon’s son Shooter Jennings, and Ali showered Waylon with gifts over the years. When it came to the fourth member of The Highwaymen, the friendship manifested into music. 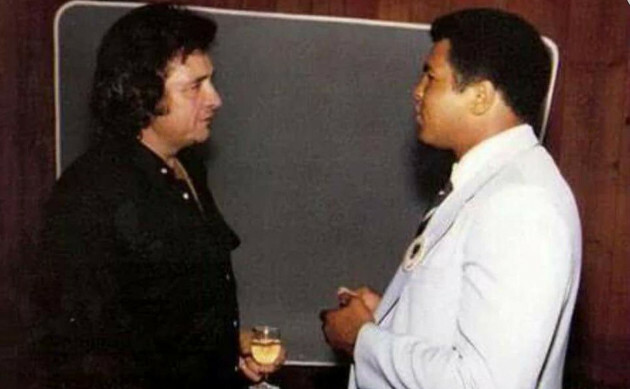 When Johnny Cash met Muhammad Ali, the boxer presented Cash with a poem called “Truth.” Cash valued the poem so much, he kept it locked away in a vault for years, but not before setting it to music in a piano tune, and recording it in the studio. The song, and the story behind it are regularly mixed up with another Johnny Cash song called “What Is Truth” which carries a strong, anti-war message that is easy to associate with Muhammad Ali. “What Is Truth” was released in 1970, eventually peaking at #3 on the country charts. But the Ali-inspired “Truth” was never released, until it found its way onto the compilation Johnny Cash: Bootleg Vol. IV: The Soul of Truth released in 2012. The song was likely recorded in January or May of 1979, with Jack Clement and Jack Routh acting as producers. Johnny Cash envisioned it as a Gospel tune. Johnny always believed that Muhammad Ali had written “Truth” for him, and probably died believing such. But when researching for the 2012 Bootleg Vol. IV compilation, producer Gregg Geller discovered that “Truth” was actually written by a teacher of universal Sufism named Hazrat Inayat Khan who died in 1927. Nonetheless, Muhammad Ali’s gift to Johnny Cash resulted in a beautiful and inspired piece of Gospel music from Cash, and exemplifies just how far the touch and impact of Muhammad Ali went throughout the country and world. Didn’t no about this. Nice article! I didn’t really know this either too, this is a cool post! Also related, on the Waylon Jennings fanpage they posted the pic of Muhammad Ali at Shooter;s christening with a nice message and you can really see some pretty stupid comments coming out in the comments section there about Ali. At least the most-liked comments are those supportive of both Waylon and Muhammad. There are also quite a few Vietnam veterans in the comments that say they don’t hold it against him and have mixed feelings about the war itself. Part of it may be that he didn’t run to Canada. He stood his ground, before it was cool to be against the war, and took his punishment just as stoically. Beyond that, I think there are plenty who choose to evaluate him and others on the content of their character, rather than if they’re Sunni Islam or black or so forth. Which is how it ought to be as far as I’m concerned. Screw these bastards who can’t put their political differences aside for one freaking day to honor one of the most revered people on the whole planet. Some people just love to hate anything and everything. I think there is a lesson to be learned in the way Waylon approached his friendship with Ali, and if people choose not to learn it because they would rather be bitter, then it’s their loss. Ali took the time to be at Shooter’s christening to prove that his friendship with Waylon wasn’t just symbolic. And there is something to be said for a man who talks the talk, but in the end is able to put his money where his mouth is, even when what he’s doing is, for the moment, “unpatriotic” or “un-American” in other peoples’ minds, such as coming out and boldly saying he wasn’t going to fight in Vietnam. 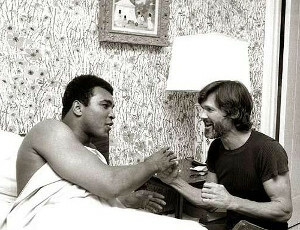 Ali was a great fighter, and he also led a very dignified battle against his Parkinson’s condition. For those reasons, and countless others, he is a symbol of what makes America a great nation. Excellent and timely article. Great to learn these tidbits. This is an excellent article, Trigger! This is another reason I love this site. Thanks. Was unable to locate one earlier. Thanks for posting Trigger. Great to see how my favorite musicians intertwined with a great humanitarian. Ali’s training camp was in PA, not too far from me. There’s many stories of him, his crew, and his guests interacting w/ the locals. The consensus is that he was a likeable, down-to-earth, smart, funny guy. As huge an international figure as Ali was, stars of that era were much more approachable than the ones today. As a kid, I managed to meet him several times outside events like the Boxing Writers Dinner and got him to sign a book and poster for me. That was before sports autographs became a commodity to buy and sell. Thanks for this article, this is so cool to learn about! The Highwaymen were so classic and iconic, and I had no idea that they were friends with Muhammad Ali. Thanks for a great blog whoever runs this, I look forward to staying tuned for upcoming posts!